E-mail – Website – Map (408) 287-2640 Santa Clara County residents. Call for appointment and referral Tue.-Thu. $4 per month membership to Fireside Friendship Club. Lunch Weds. E-mail – Website – Map (408) 292-3157 Homeless, seniors, families, youth. Breakfast on second and last Sunday of the month from 7:00-9:00am. Call for information on emergency food. Breakfast. Emergency food and food baskets for needy families. (408) 288-2153 All. Coffee House: Tue.-Thu. 9:00-10:00am, Open 7 days: Dinner at 5:00pm, Mon.-Fri., Breakfast 6:30am, Lunch 11:45am-12:30pm, Lunch and Dinner must attend Chapel meeting. Sat. 8:00am Breakfast, Sun. Lunch 10:45am. Spanish and Vietnamese spoken. Breakfast, Lunch, Dinner. Major cross street is Santa Clara Ave.
Map (408) 286-0348 All. Serves a free meal to anyone 3rd Saturday at 5:00pm. Dinner. (408) 294-2963 Fax Homeless persons who are not able to participate in other programs due to compliance. Drop in Mon., Wed., Fri. 8:00-9:00am. Thu. and Sat. 9:00-10:30am, Tue. 9:00-10:00am. (2nd and 3rd Tue. of the month only). Breakfast only. (408) 694-0007 Fax All. Photo ID and proof of address for all adults, bring ID for children to the agency to which the person has been referred. Call to receive referral 8:30am-4:00pm. Emergency box, Brown bag or Family Harvest Program. Picture ID required, proof of address required. PIN [Partners In Need] program. Volunteer for 3 hrs. and get 1.5 bags of groceries. Spanish and Vietnamese spoken. Provides referrals to the closest available food programs (member agencies only) to people needing food assistance in Santa Clara County. No fee. Spanish, Vietnamese spoken. E-mail – Map (800) 884-1136 All. Show up at St. James Park at 1st St. and E. St. James St. in San Jose. Starting May Saturday 2:30-5:00pm. There’s only one Food Not Bombs in San Jose. It’s now at 5 pm at Fountain Alley near 1st and Santa Clara . Groceries ar also given . Early supper Vegetarian. 408 947-7834 All. 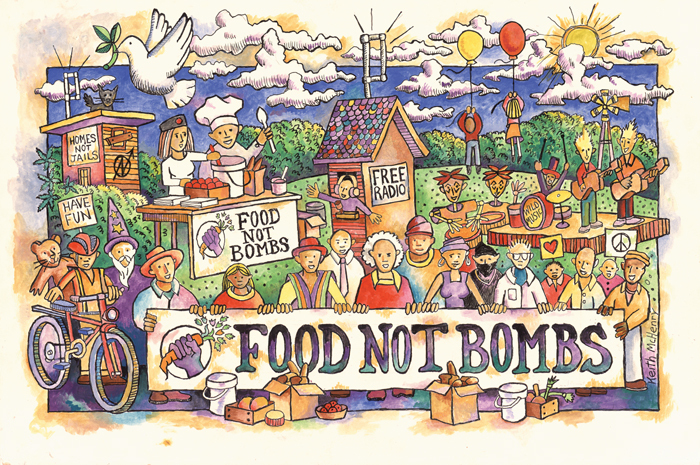 There’s only one Food Not Bombs in San Jose. It’s now at 5 pm at Fountain Alley near 1st and Santa Clara. In May they may go back to St James parks. Groceries are also given. Early supper Vegetarian. Use VTA bus 22, 65. Website – Map (408) 271-5160 men, women and families. Open from Mon.-Fri. 1:00-7:00pm, Sat.-Sun. 5:00-7:00pm. Call at 8:00am for bed reservation. Showers and meals. Emergency beds, and working men’s beds. They provide vouchers for Eye exam, eye glasses We refer clients to an optometrist., California ID, Driver License, Birth Certificates, Bus pass. Website – Map (408) 271-5160 All. Mon.-Fri. Breakfast 6:00am, Sat & Sun 7 Am outside clients 8 am Lunch Mon Tues.& Thurs. 12:00pm Wed, Fri & Sat 1pm Mon. Tues. Thus- Dinner 6:30pm Wed, Fri,Sat ,Sun 6:00pm Breakfast, Lunch, and Dinner. (408) 971-9079 Fax Persons 60 years and older who are unable to live independently, need support and help in their daily activities, are unable to participate in programs for independent seniors, and would benefit from the social experience and stimulation of this personal program. Call for times and information. Adaptive physical exercise, music programs, arts and crafts projects, discussions on current events, and times of reminiscing, visits from volunteers of all ages. Breakfast and a hot, nutritious lunch are served daily, and beverages are available throughout the day. Website – Map (408) 224-9360 All in need. Call for information or drop by. Tue. night Food Boxes, Sun. Dinner at 2:00pm. E-mail – Website – Map (408) 293-4505 Persons in need Stop by, sign in Early meal Mon,Tues.,Thus. at 4:30 p.m.
Fax: 408.293.6557 Serving all in need Drop in Tue.-Wed. for dinner at 4:00-5:00pm. Spanish spoken. Dinner. E-mail – Website – Map 1(800) 510-2020,408-350-3246. Fax: (408) 249-8918 Homebound and Disabled Seniors 60+. in SANTA CLARA COUNTY Call for information Mon.-Fri. 8:00am-5:00pm. Encourages $2.00 per meal contribution. Provides home delivered of Frozen lunches, breakfast and dinners weekly. Phone: (408) 975-4862 (Primary phone) Homebound and Disabled Seniors 60+. in SANTA Clara County Call for information Mon.-Fri. 8:00am-5:00pm. Encourages $2.00 per meal contribution. Lunches, breakfast and dinners weekly. Map (408) 275-1315 Wed. 12:30pm. Catered: Indian cuisine. Map (408) 293-0877 Tue. and Thu. 12:00pm. Lunch cook on site: Portugese cuisine. Website – Map (408) 278-2160 All residents in ZIP Code areas 95110, 117, 125, 126, 128, 132, 134. Need medical cards or birth certificates for each child; proof of address. Open Mon.-Fri. 9:30am-3:45pm (for clothing only). ID required. Obtain referral from Food Connection at (800) 984-3663. Spanish spoken. Bag lunches available every morning at 9:30am until they are gone (usually about two hours). Food box (two bags of food each month). Website – Map (408) 282-1175 All. Mon.-Sat. Lunch 12:15-1:15pm. Dinner 5:00-6:00pm. Sunday needs to participate in church services, Dinner only 5:30-6:30pm. Lunch, Dinner cooked on site. Map (408) 292-2123 All. Mon.-Sun. 11:00am-12:00pm. Spanish, Portuguese, French, and Italian spoken. General lunch items. Map All that are interested. Sat. 12:00pm (Newblath Recovery Home). Sun. 9:15am (Bethel Church, http://www.bethel.org). Sun. 12:45pm (Golden Alter Ministry). Sun. 3:00pm (1st Sun.) (Golden Alter Ministry). Sun. (2nd Sun., Sept.-May) (Los Altos Youth Ministry). Church volunteers pick-up interested persons for services and meals. Guests returned to St. James Park afterward. Map (408) 297-3338 Mon.-Fri. 12:00pm. Meals cooked on site. Do any of these sites accept home baked donations such as breads, muffins, etc? Soup kitchens accept SANITARY FOODS: 1. Fresh, 2. Canned, 3. Bottled. Feeding a hungry public is nice, as well as tasting variety. FOOD SANITATION IS EXTREMELY IMPORTANT; FDA Guidelines on Kitchen and Food Safety are available in most Public Libraries SO ILLNESS OR INFECTION FROM WHAT YOU EAT IS GREATLY REDUCED! Where can I donate my culinary skills this Xmas? I’m a chef! My family and I would like to volunteer to prepare and/or serve food on Christmas Day. Please contact me at 408-712-8607. Thank you. Let us know who replies to this……I would like to give a special thanks..
Inn Vision in San Jose cancelled their Breakfast to the Homeless who are not residents in 2013. The free Saturday morning breakfast food expense and preparation is done by a Catholic group at no cost to Innvision.